The biggest fight of the year and probably UFC history happened on Saturday and typically, Khabib Nurmagomedov secured his 27th victory against the self-proclaimed “the king” Conor McGregor. The fight was every bit as big and exciting as we had expected. It drew an attendance of 20,034, highest in UFC history, making $17.18 million on ticket sales alone. Both fighter’s earnings were also record-breaking, making them the first UFC fighters to be paid multimillions for an octagon fight. Khabib was given a flat sum of $2 million guaranteed, and McGregor was given a full one million more, claiming that he is estimated to earn up to $50 million dollars, once PPV sales, bonuses and sponsorship deals, fall through. But what ensued after the match is what caught our attention. After McGregor’s loss, members of both fighter’s camp, got into a massive brawl. We all knew the fight was going to be high intense, when both fighters refused to touch gloves before the opening bell. But surprisingly Khabib put up a powerful display, as he dominated the Irish brute in every round except the third, ultimately forcing McGregor to tap out in the fourth round. That is when all the craziness began. After Mcgregor tapped, a member of McGregor’s team and Khabib immediately got into it, talking smack to each other, Khabib quickly lost his temper, jumped out the octagon and began beating up said person. UFC security immediately intervened, trying to break out a brawl that had now escalated. One of Khabib’s people then jumped into the octagon, and hit McGregor at the back of the head, several other members of Khabib’s team also jumped into the octagon and ganged up on McGregor, trying to get their hands on the UFC superstar. 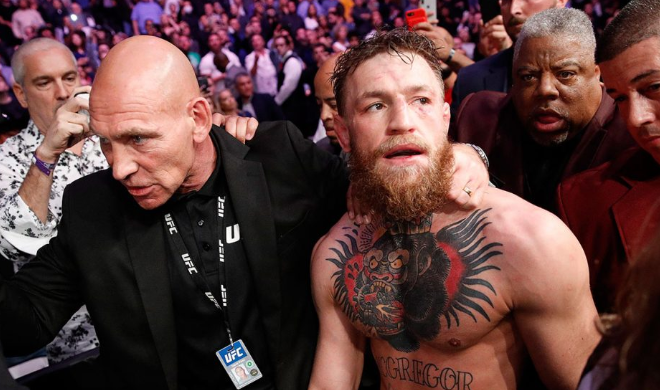 Luckily UFC security were able to break it up before any real damage was inflicted, and thanks to the Nevada state police department, order was restored. The authorities made a few arrests here and there, and escorted Khabib and his team members out of the building. In the post-fight press conference, Khabib apologized to the Nevada state athletic commission, stating reasons for his action “I know this is not my best side.” He said. “But I am human being.” He then probed on why it’s only his actions after the fight that is being questioned, why not McGregor’s actions when he attacked Khabib’s bus, putting people’s life at risk, or McGregor’s words when he bad mouthed his religion, his country and insulted his father. Dana white, UFC’s president also stated in an interview: “I don’t know what to say, I’m just disgusted and sick over it. Three guys from khabib’s team were arrested – I spoke to him (McGregor), he’s upset about the fight, not the fight after the fight.” And when asked if he thought the rivalry between both fighters was over, he said “They both made it very clear that the rivalry would not be over after the fight.” Hinting to a possible rematch. The Nevada state athletic commission is considering suspending Khabib, and depending on the length of the suspension, Khabib could be stripped of the lightweight championship title. But so far, the commission have decided to withhold his earnings and his belt, till further notice. It is sad that such a historic night ended with so much ugliness.